Aired November 29, 2018 – Published December 19, 2018 – Radio-Canada Info – Thousands of Canadian women have had silicone breast implants of a new generation approved in 2006 by Health Canada. Apart from some known complications, these implants were said to be safe for women’s health. Yet, in recent years, hundreds of women have had their implants removed due to various problems. New studies have shown that silicone implants are associated with the development of autoimmune diseases and a rare form of cancer. Breast Implant Illness is still controversial. An inquiry conducted by Enquête, in collaboration with the International Consortium of Investigative Journalists, Radio-Canada, CBC and the Toronto Star, revealed that Health Canada approved the release of these implants without long-term studies and allowed manufacturers to not adequately report breast implant-related adverse events for years. Cameramen: Éric Carbonneau, Jean-Pierre Gandin, Richard Marion, Laurent Racine, Luc Robida. March 27, 2019 – Kaiser Health News – FDA Commissioner Scott Gottlieb announced in a tweet Wednesday that the agency plans to release hundreds of thousands, if not millions, of previously unpublished injury and malfunction reports tied to about 100 medical devices. “We’re now prioritizing making ALL of this data available,” Gottlieb tweeted. The agency made changes to the “alternative summary reporting” program in mid-2017 to require a public report summarizing data filed within the FDA. But nearly two decades of data remained cordoned off from doctors, patients and device-safety researchers who say they could use it to detect problems. Gottlieb’s announcement was welcomed by Madris Tomes, who has testified to FDA device-review panels about the importance of making summary data on patient harm open to the public. March 7, 2019 – Kaiser Health News – Dr. Douglas Kwazneski was helping a Pittsburgh surgeon remove an appendix when something jarring happened. The surgical stapler meant to cut and seal the tissue around the appendix locked up. “I don’t want to sound over-dramatic here, but it seemed like a cover-up,” said Kwazneski, who practiced in Pasco County, Fla., from 2016 through earlier this year. Madris Tomes, founder and chief executive of Device Events, was a contributor to this article. Device Events is the only tool that enables healthcare providers to find and analyze the hard-to-find “alternative summary reports” discussed in this article. November 26, 2018 – INTERNATIONAL CONSORTIUM OF INVESTIGATIVE JOURNALISTS (ICIJ) – Manufacturers fought to get implants back on the market. Regulators gave in. Now thousands of patients are paying the price. More than 10 million women worldwide have received breast implants over the last decade, a remarkable comeback for a medical product that had suffered a crippling safety scandal and a lengthy ban in the United States. The U.S. Food and Drug Administration’s decision to restore silicone implants to the market in 2006 followed an earlier decision to approve the less-commonly-used saline-filled implants. It came after a furious lobbying campaign by leading manufacturers Allergan and Mentor, which convinced regulators that frequent ruptures and leaks, and an array of other ailments reported by breast implant patients, were concerns of the past. But many of the hazards that caused breast implants to be banned in the first place never went away, a global investigation led by the International Consortium of Investigative Journalists has found. A growing body of scientific literature links breast implants to autoimmune disorders and a rare form of cancer that has claimed more than a dozen lives worldwide. Madris Tomes, founder and chief executive of Device Events, was one of the many contributors to this article. November 25, 2018 – INTERNATIONAL CONSORTIUM OF INVESTIGATIVE JOURNALISTS (ICIJ) – The Implant Files is a globe-spanning investigation revealing a broken system that allows flawed medical devices to go onto the market — and into our bodies. Involving more than 250 reporters in 36 countries, ICIJ reporters and partners with hundreds of patients about the system’s pitfalls. There are countless medical implant success stories to celebrate. But the public is often the last to know about potentially dangerous malfunctions tied to implants. November 2, 2018 – Medical Design & Outsourcing – The U.S. FDA today announced a memorandum of understanding with the Department of Defense to accelerate regulatory assessment of medical products for military personnel. Congress last year passed a law to expedite regulatory review of products to diagnose, treat or prevent serious diseases or conditions facing U.S. military personnel. The memorandum establishes a framework to implement the 2017 law. It allows the Secretary of Defense to request that FDA speed up the review of investigational submissions, applications for approval/licensure, and submissions for clearance for particular medical products. The increased collaboration between FDA and the military may actually prove to be good news for medical device safety, according to Madris Tomes, a former FDA analyst who is founder and CEO of medical device safety information software company Device Events. July 20, 2018 – New York Times – Bayer announced on Friday that it would discontinue sales of its Essure birth control implant by the end of the year, bowing to a lengthy campaign by health advocates and thousands of women to get the device off the market. The implant has had a troubled history. It has been the subject of an estimated 16,000 lawsuits or claims filed by women who reported severe injuries, including perforation of the uterus and the fallopian tubes. Several deaths, including of a few infants, have also been attributed to the device or to complications from it. Madris Tomes, a former F.D.A. medical device official who runs a company that analyzes adverse event data, puts the figure closer to 30,000. “With side effects ranging from hair loss and tooth loss to chronic pain, severe bleeding, miscarriages and even death, the benefit risk profile touted by Bayer simply didn’t jibe with the data that was pouring into the F.D.A. from both patients and physicians,” said Ms. Tomes, who has done pro bono work for an Essure patient advocacy group. 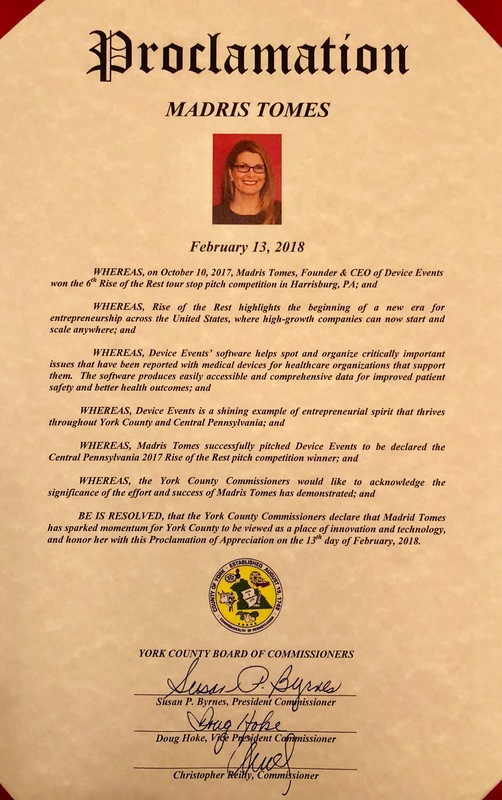 February 13, 2018 – York County – Women’s Business Center Organization Meeting: More than 100 people attended a York County Women’s Business Center Organization (WBCO) Luncheon, where Madris Tomes, Founder & CEO of Device Events and winner of the 2017 Rise of the Rest pitch competition, shared her story as an female entrepreneur. After her keynote presentation, Ms Tomes was surprised to also receive a Proclamation on behalf of the County of York PA. The Proclamation was presented by York County Commissioner Chris Reilly. Madris Tomes and Device Events is mentioned at 46:37 of the podcast.